Chickpea Soup recipe by SumeraNawed at DesiRecipes.com. Delicious homemade, ready in less than 20 min chickpea soup. Carrots and yellow onions sauted in ground spices and simmered on low heat in Chicken broth along with Zucchini until fragrant. In a large saucepan over medium heat, warm 2 tablespoons oil. Add the tomato , bell pepper, 1 teaspoon salt , cumin, turmeric and cayenne. Saute until fragrant, about 1 minute. 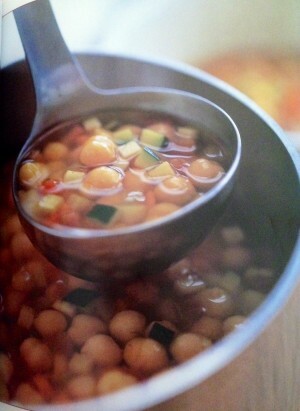 Add the chickpeas , zucchini and broth. Raise the heat to medium-high and bring to a boil. tender and the flavors are blended, about 15 minutes. Season to taste with salt and black pepper . Ladle into bowls, drizzle with olive oil and serve hot.